Glennagalliagh Mountain is the 745th highest place in Ireland. Glennagalliagh Mountain is the third highest point in county Clare. There is a track at R6395472575 A to the south of Glennagalliagh on OS map 58. 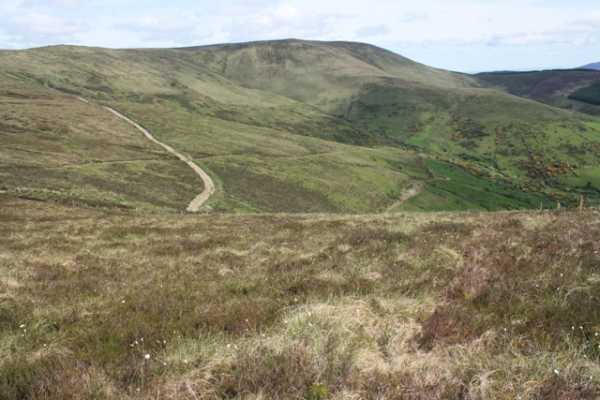 This track gives access right to the summit of Glennagalliagh, and is the vehicle route for the turf cutters referred to by paddyhillsbagger. It also gives access to quad bikes and their transport vehicles as they were much in evidence when I was there on Sunday. Low slung vehicles won’t enjoy this bumpy track, but for those with suitable cars there is space to park a little way along the track at a track junction. Beyond this junction only rugged vehicles will negotiate the bumps and dips of the track. For the walker it’s about a 1.5 km walk up to the summit, going past the slightly lower summit a couple of hundred metres to the south of the main top. The turf cutting is spread over the whole summit area. There are wonderful views down into the valley to the east. The eye sweeps around the valley, taking in Ballykildea Mountain and the steep south slopes of Moylussa and Cragnamurragh. I think the wire fence around the summit could be electrified but I didn’t see a warning sign.